This dazzling debut announces a not-so-new voice: that of the spoken-word poet Tjawangwa Dema. 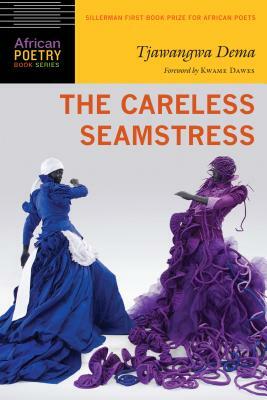 Winner of the Sillerman First Book Prize for African Poets, Dema’s collection, The Careless Seamstress, evokes the national and the subjective while reemphasizing that what is personal is always political. The girls and women in these poems are not mere objects; they speak, labor, and gaze back, with difficulty and consequence. The tropes are familiar, but in their animation they question and move in unexpected ways. The female body—as a daughter, wife, worker, cultural mutineer—moves continually across this collection, fetching water, harvesting corn, raising children, sewing, migrating, and spurning designations. Sewing is rendered subversive, the unsayable is weft into speech and those who are perhaps invisible in life reclaim their voice and leave evidence of their selves. As a consequence the body is rarely posed—it bleeds and scars; it ages; it resists and warns. The female gaze and subsequent voices suggest a different value system that grapples with the gendering of both physical and emotional labor, often through what is done, even and especially when this goes unnoticed or unappreciated. A body of work that examines the nature of power and resistance, The Careless Seamstress shows both startling clarity of purpose and capaciousness of theme. Using gender and labor as their point of departure, these poems are indebted to Dema’s relationship to language, intertextuality, and narrative. It is both assured and inquiring, a quietly complex skein that takes advantage of poetry’s capacity for the polyphonic. Tjawangwa Dema is a poet from Botswana, an arts administrator, and a teaching artist in Bristol, England. Her chapbook, Mandible, was published in the box set Seven New Generation African Poets, and her poems have appeared in the New Orleans Review, the Cordite Review, and the Rio Grande Review.